The car was commissioned to be built by the owner in Northern California in 1966. The car was finished by Tom Meade in 1968 and brought over from Italy. Very soon after arriving it was shown at the 1968 Pebble Beach Concours d'Elegance. It was titled in California as a 1967 Ferrari 250 P4, paying homage to its rich Ferrari history as well as the P4 race car inspiration. This elusive piece of automotive history was then considered lost since 1971 as it was not seen in public till this year. It was actually bought by the current owner in 1983 and stored for some time after that. As you can see from several of the pictures, the car was built and designed very closely with Ferrari and Maserati engineers and mechanics as Tom Meade had worked for the Maserati race car division at one point. You can see the pictures of Enzo Ferrari standing next to the car with Tom Meade and several Ferrari mechanics as well as pictures of this car on the Fiorano race track at the Ferrari factory being tested. 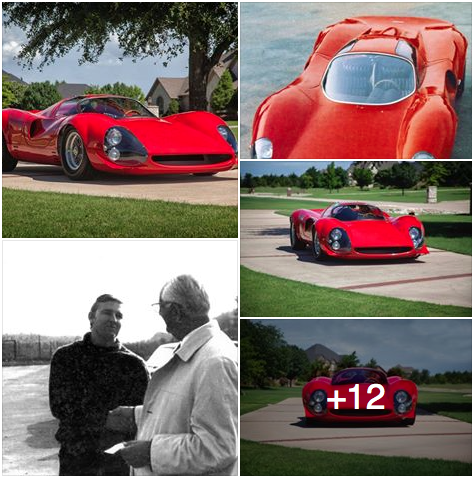 The car was restored and being represented in October 2015 by Red Car Restorations of Rockwall, TX on Ebay for 9 million dollars. The car was sold; actual selling price is unknown.